Everyone knows the old saying: lift with your legs, not your back! Some very helpful observer has probably materialized to make sure you remember that every time you’re about to pick up a heavy box. You know that observer; the one who’s “hands are kind of full right now” whenever you need help hauling the couch. Everyone also knows why you’re supposed to do this. Apparently, lifting with your back could seriously hurt you. The first time you did this, you probably had another helpful observer run over as if you were on fire, saying something like “ooh, ooh, ooh!” or “careful! Careful! Ouchie!” Their tone of voice generally implies they’re speaking to a baby with a fork. What everyone doesn’t know, however, is why you should lift with your knees instead of your back. If you’ve ever confronted the observer about why they’re so sure you’re lifting wrong, they’ve probably stammered something about how it’s bad for your back and you’ll hurt yourself before making themselves uncharacteristically busy. First, the bad news: they’re right. Back injuries are probably the most common problem movers have to contend with. The back is a delicate system of muscle tissue, bone, and nerves, and like most delicate systems it’s easy to throw out of whack. Lifting with your legs instead of your back really is a good first step to avoiding a back injury while you move. Now the good news: you can do more. If you get to know why backs get strained during moves, not only will you have something to throw back at the observer when they come over to “help,” you’ll be able to point out all the things they’re not doing right! It’s payBACK time! …Anyway, here’s why back injuries and how you can prevent or treat them. We’ll do our best not to make any more back puns. Please don’t hit that back button. The tricky thing about back injuries is they can happen for a lot of reasons. Like we said, the back is a complicated system with a lot of parts working together. Pain in the back generally means one of two things: either a muscular injury or a spinal injury. 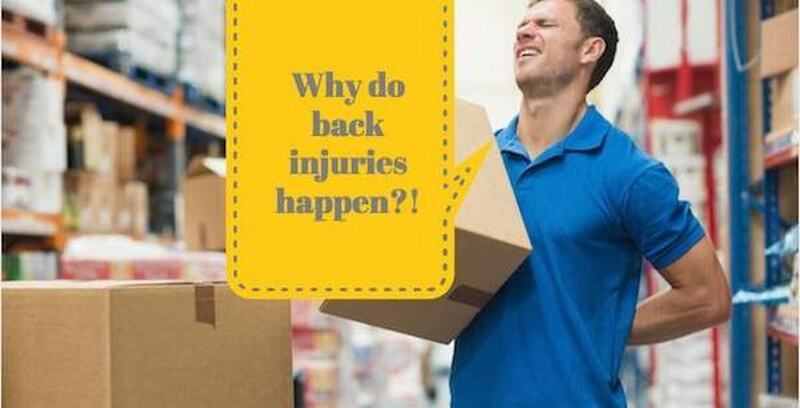 Luckily, back pain means muscle strain most of the time, particularly when moving is involved. Muscle strain in your back happens when the tendons and muscles of the back–particularly the lower back, down by the tailbone–become overworked. Bending down to pick up something heavy stretches out the soft tissue of the lower back. When your knees are locked and your legs are straight, all the work of bending is being done by this soft tissue. When you put that much strain on this soft tissue repeatedly, it is at risk of tearing or becoming inflamed. Then, if you lift a heavy object by straightening your back up again while keeping your knees locked, you’re using the same muscles you’ve overworked by bending repeatedly as the primary source of power required to lift. In order to straighten your back and provide the power you need from them, these muscles have to suddenly contract. This repeated, rapid stretching-and-contracting will result in back pain. First you stretch out your soft tissue by bending repeatedly, then you force it to contract hard in order to lift a heavy object. It sounds tiring, and it is! The pain you’re feeling is the same pain, in principle, that you feel in your muscles after a hard workout. You don’t want to break down muscles in uncontrolled circumstances, however; it won’t help you get stronger and you could hurt yourself. Don’t trick yourself into thinking lifting with your back will make you buff or that it’s “good” for you. If you feel pain in a specific part of your back, (such as the lower right or left or square in the middle of your back) it may have come from twisting your spine while bending or lifting a heavy object. When you twist while you’re bending or lifting, not only are you overworking your back muscles in the way described above, you’re also straining them by forcing them to work in multiple conflicting directions at once. Back injuries that result from twisting feel more localized and often result in more severe pain than typical muscle injuries. Most back pain suffered during moves isn’t dangerous, even if the pain feels very severe. Muscles and ligaments in the lower back are centrally located, so they get a lot of blood flow and recover from injury quickly. Even pulled ligaments causing excruciating pain will typically heal on their own, provided you rest and do nothing to exacerbate the problem such as continuing to overwork your back. Back pain can be a major inconvenience in your day to day lift even if it isn’t cause for medical alarm, however. Bad pain can come in waves or be triggered by what would usually be an innocuous movement such as turning your head or tying your shoe. Your back may be overly sensitive or sore to the touch. Depending on the stiffness and level of pain, you may have to expect a reduced range of movement. Some back strains reduce your ability to bend or turn, for instance. You may also experience muscle spasms, or twitches, in your lower back. Standing or sitting in a chair for long periods of time may become painful. The heaviest pain caused by a pulled back should subside after a few days of rest, but intermittent pain that can come on suddenly could last months. Back pain is particularly annoying because it’s virtually impossible not to use your back muscles every day, even if you’re consciously trying not to. There are situations in which a back injury is very serious. If the pain in your back does not even reduce after several days of rest, if it worsens, or if it spreads to other parts of the body, especially the legs, seek medical help ASAP. These could be signs of spine or nerve damage. Similarly, see a doctor if you find your back pain impedes your movement for longer than about a week, or if you start to experience symptoms such as a loss of bladder control, numbness or weakness in your back or legs, or a fever. Keep in mind that even very severe spine and nerve injuries are not always immediately obvious. If you suspect you might have one of these injuries, seek medical help immediately; spinal injuries are a very common cause of lifelong paralysis, and can even result in shock and death. It’s always better to be safe than sorry–another piece of life advice from the helpful observer–so if your back pain feels different or worse than any back pain you’ve experienced before, trust your gut and go see a doctor. It’s difficult to diagnose a back injury on your own, but if your doctor discovers something serious, you could be saving yourself from a bad problem down the line. There are two types of back pain: chronic and acute. Acute back pain is far more common than chronic pain. Acute back pain is usually caused by strain or overexertion. It comes on quickly and doesn’t last more than six weeks. When you experience acute back pain, it’s usually caused by a disruption to the way components of the back fit together. Fortunately, acute back pain is easy to treat. Using a cold pack in the first 24 to 48 hours won’t actually treat the causes of your pain, but it might help fight swelling and inflammation. A heating pad can stimulate blood flow to the strained area, promoting faster healing. It might also help reduce pain so you can resume regular activities. Likewise, over-the-counter pain reducers will help dull the pain you experience day-to-day. Just be sure not to overdo it. You should avoid doing work that will further strain your back, but don’t go on bedrest or stop moving entirely. It’s important you resume your regular routine as soon as possible. This will allow your back to build itself back up. Massage or acupuncture can also help adjust or relax the spine and its surrounding tissues. Chronic back pain lasts for more than 3 months. It’s usually considered evidence that you have a back problem that will not heal on its own. Sometimes chronic back pain occurs when after and as an indirect result of acute back pain. The person suffering from acute back pain naturally avoids working the injured muscles. This results in muscle atrophy, as the muscles become weaker from disuse. These weakened muscles are at greater risk of continuous injury and can become strained from regular use. In this case, muscular therapy and exercise are recommended to build the back muscles back to their normal strength. It’s important to remember that chronic back pain can also be a sign of a more serious condition. These problems can make the sorts of exercise routines you might perform to strengthen your back dangerous, so if you are experiencing chronic back pain, consult with a physician before you take any steps toward treatment. Did we scare you with all this talk of debilitating back problems? Are you feeling nervous about your upcoming move? Don’t be! Check out our blogs on how to overcome moving stress and how to avoid moving injuries. Then you’ll be more than prepared to take on (almost) anything moving can throw your way. And if you need any extra storage space, remember: Storage Direct always has your back. Yeah, we know we already used that one; back off. …Ok, sorry, we’re really done now. Come back. We know you’ll come back. Please come back.